In Psychiatry, there used to be something called a Rorschach test.. where they show you ink blots and ask you what they look like. The idea is that one would “project” one’s ideas and worries into the object, and you could get an idea what was on their mind. Sort of the equivalent in religious people seeing Jesus in burnt toast or pacifists seeing phallic symbols in guns and weapons. 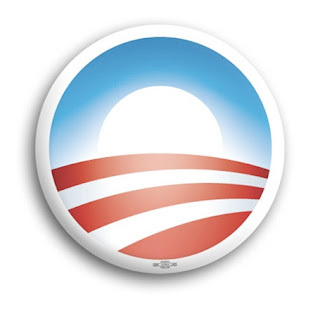 Heh…is that “O” in the new design a subliminal way to remind one of Obama? On the other hand, those who really are into Obamaphobia are pointing out the MDAÂ logo has a strange resemblance to the crescent and star that symbolize Islam, and that the logo has a strange resemblance to the design of the Iranian Space Agency (PHOTO LINK). So both sites have oodles of angry Islamophobes wondering about the symbolic meaning behind the new design. Time out, fellahs. Sometimes a design is just a design. 2 users commented in " Obama’s Missile Defense Agency Logo Is Raising Questions "
Too bad your article is so flippant about the Obama administration changing logos of Government agencies. The question is, why is Obama having the logo changed of a Government agency? Psychology is used in advertising. The design is a subliminal message that Obama controls the agency. How many other agencies logos will be changed to resemble an “O” that represents Obama? It is easily document able that Obama has surrounded himself with socialists/Marxists. This logo looks eerily like communist propaganda, but the “O” is in place of his picture.